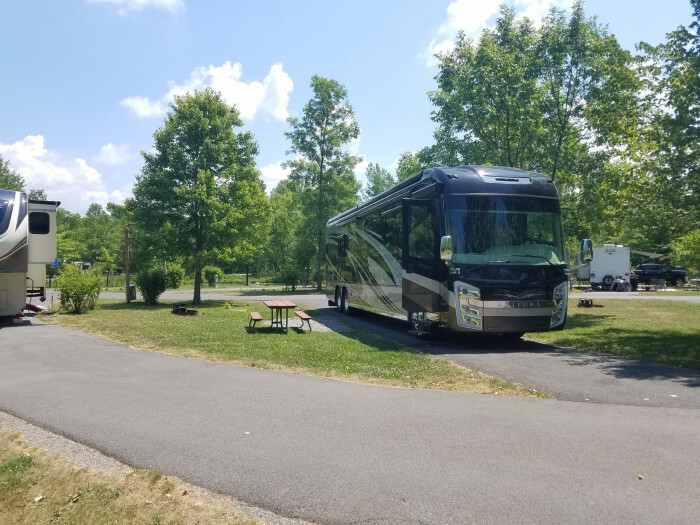 Ask fellow campers about "The Villages RV Park at Turning Stone" and nearby attractions. This is one of the top five RV parks I have visited across the country. Extremely nice - would recommend it to anyone. 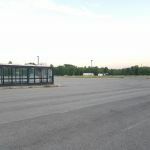 All sites are asphalt and roomy. You will be very pleased with this facility. We camped at The Villages RV Park at Turning Stone in a Fifth Wheel. Traveling in a 38 foot coach we stayed 4 nights in a site for big rigs (site 309). The site was level and paved. The sites are roomy with grass and trees between. Ours was a middle site, but we still had a nice view of one of the lakes thru our front window. If you have a dog there is ample area to walk your pet. Our satellite worked great here and there was good wifi. An added bonus, there's a courtesy Casino shuttle that runs between the casino and the RV park. The park is located in a quiet area. We really enjoyed our stay here and would go back. We camped at The Villages RV Park at Turning Stone in a Motorhome. $51 day/ FHU paved site with cable/WiFi/picnic table and firepit Pros Huge campground with over 600 sites Sites are spacious and well defined Pool is well maintained Truly handicap accessible showers (best ones we have ever seen) WiFi was strong throughout park was high speed Paved roads/sites Truly no bad sites (no need to be by the lakes) Paddle boats for rent Camp store on site Laundry (1.25 wash/dry) TV room Trails around campground Shuttle to Turning Stone runs 24/7 and is free Cons Due to the size, they are very strict about the 11am check out (not a big deal just felt like a criminal at 1030am when we were packing up to head out) We camped at The Villages RV Park at Turning Stone in a Motorhome. First time staying here and will plan to come back for a longer stay. We camped at The Villages RV Park at Turning Stone in a Motorhome. Very pretty park with blacktop roads and sites. It's the kind of CG that I enjoyed walking and biking around. Pool and large play area for the kids. A shuttle will take you to the casino. The casino looks fairly new. They appear to have a lot of entertainment on certain days. We would return. We camped at The Villages RV Park at Turning Stone in a Motorhome. The park is very well maintained and clean! The staff were very helpful and knowledgeable about the area. Our section (600-White Birch) has a huge grassy opening in the middle for campers to do things. I believe this is true for each section. Plenty of offerings for kids at the park. Sites were spacious with paved roads. Some facing the wood line tend to slope downward, but not an issue for us. The bath houses were very clean and big. 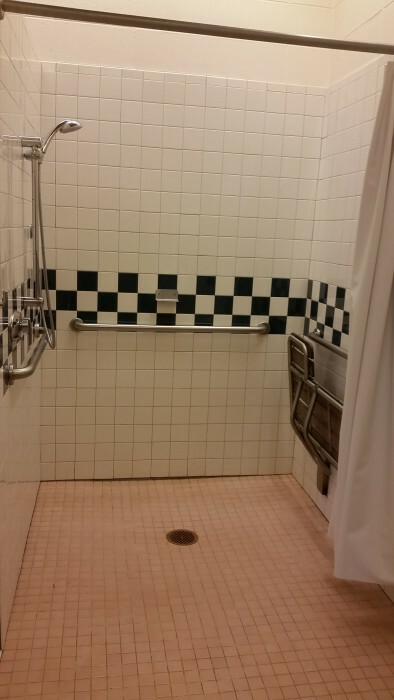 Shower stalls were at least one and a half times bigger than what we usually see. NO overhead wires anywhere. All underground. There were some low hanging tree limbs on the roads to each area, but no major issues for our 34' TT. All things considered, price was reasonable considering what could have been charged! And the Good Sam discount help also. Shuttle service was continuous and well received. All-in-all, I would consider this park a diamond in the rough. We camped at The Villages RV Park at Turning Stone in a Travel Trailer. Many things to see and do in the area. State parks and beaches are a short drive away. Rome is 12 miles down the road with all kinds of historic places to visit. And if you want a true picture of the "corner meat market", there are PLENTY! Brought home 30 pounds of fresh sausage. Located just 5 miles from I-90. And the casino is fabulous. Shows, big named stars, restaurants, and let's not forget the gambling if you are so inclined. My wife and I stay here when ever we come to Syracuse to visit my brother, a great place and close to the casino. Large roomy site, wish they would stay open longer in the fall so we could come up for the autumn colors. We camped at The Villages RV Park at Turning Stone in a Motorhome. Great place, plan your trip early to make sure you can get in. Weekends are almost always booked solid. Visited in our 2018 Class A, 45' motorhome. Office staff friendly & responsive. Bath houses clean. Some laundry machines out of order, $1.50wash, $1.00dry. 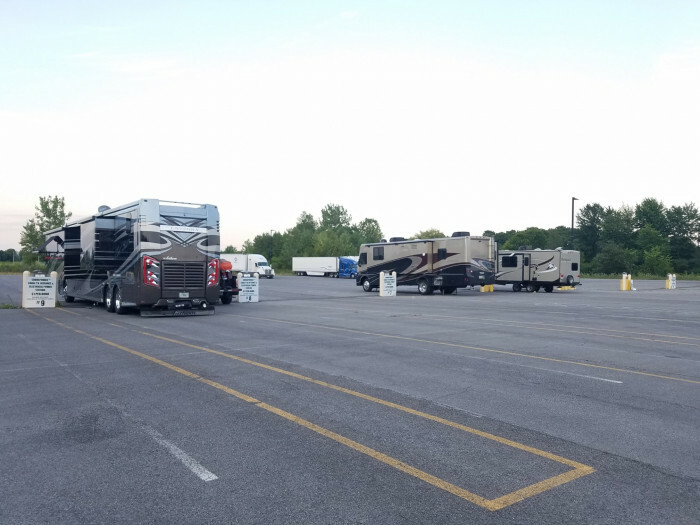 Big rig sites paved (that's great) & enough pull thru space to park tow. Our FHUs were good. Navigating is easy & turns are good, BUT there are several spots where tree limbs need trimming (roads, turns, sites) Our 12'8" height brushed several limbs. There are many shady sites where satellite would be impossible. Ask the staff if that is important to you. Would stay at this park again. If you only need a night or 2 off the road, go to the "High Roller Truck Parking" lot where parking is FREE, there are electric hook ups, and a shuttle to the Casino. Sav-On Gas (next door) has excellent gas & diesel prices. We camped at The Villages RV Park at Turning Stone in a Motorhome. Free shuttle to the Casino. Ask for a Senior Disc at the Casino Buffet during the week for the best pricing. Higher on the weekends. Visit Nikky Doodles for great ice cream and snacks. Apple Betty in Oneida has a nice diner breakfast. We were on lot 402, very nice lot, paved for set up. It was across from the fishing pond. Caught a bunch of sunnys. Lots of ducks and turtles. First time camping there, family went to bingo - used the free shuttle. We will be back for sure. Great site, WiFi, cable TV, everything you need and more. We camped at The Villages RV Park at Turning Stone in a Travel Trailer. Easy to get to from the interstate. Nice blacktop roads. Numerous trees had low hanging branches which I needed to dodge inside the campground, but someone was out trimming up the branches while we were there. There is lots of things to do here. It is run by the Oneida tribe with access to the casino for the adults. The kids used the pool. The pool area was clean and included a hot tub, small kiddie pool and larger pool. There are tennis, basketball and volleyball courts. Walking trails weaved around ponds and through the different loops. I didn't use the restrooms or showers. Staff was friendly We camped at The Villages RV Park at Turning Stone in a Fifth Wheel. Site 110. Great park! Clean and pretty. A very natural park. Great service in the office. Large trees, wide lots, good cable and strong WiFi. What's not to love? Will be back when we're in the area!! 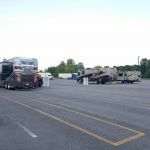 We camped at The Villages RV Park at Turning Stone in a Fifth Wheel. This is a beautiful resort. Very well maintained, staffed and cared for. The grounds are natural and exquisite. Our site was FHU and level. Cable was fine but didn't find WIFI. Did not look as we have our own hotspot. The two lakes are clean and fresh. Lots for kids and families to do. Can't say enough positive about this place. 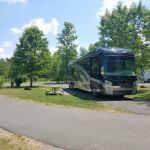 We camped at The Villages RV Park at Turning Stone in a Fifth Wheel. Nice park with a nice layout. Paved interior roads and pads. I downgraded this to a 9 because the angle of the pads and the narrowness made getting in a bit difficult. Also I feel they should have signs as to where to park for check. Not a problem for other than long 5th wheels of long motorhomes but it would really help. Otherwise we were quite happy. There are fun trails throughout the park and if you are so inclined there is a 24 hour shuttle to the nearby casino. We would stay again. We camped at The Villages RV Park at Turning Stone in a Motorhome. We just needed a stop over on the way back home to the PNW from New England area. 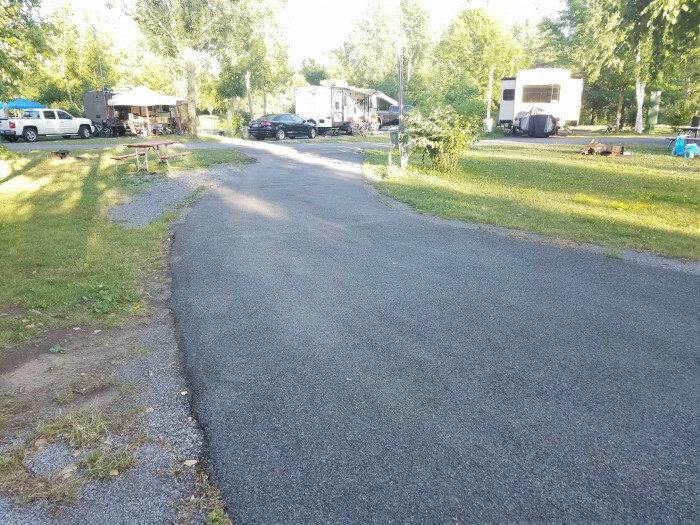 Found this park on Google maps and RV Park Reviews and what a find for you guys who travel this area frequently. 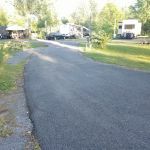 It is more of a resort than a campground, fully paved with nice green grass between sites. Site pedestal was laid perfectly with very little hoses or cords being extended, power was right at 119 on leg one and 120 on the other. Water pressure was fine and cable TV was very good and clear. Didn't try OTA and a tree blocked our Dish reception. ATT was good but their WIFI was unsecured which seems normal for the area we visited. Park is a couple of miles off I90 for a easy access and not on the casino property per se. Casino supplies a shuttle if you need a lift. One of the best parks we have used in the past 6 weeks on our New England tour. We camped at The Villages RV Park at Turning Stone in a Motorhome. We love this park. Beautiful sites, good views, paved roads. On this stay we found that the free wifi has been improved considerably - both fast and strong. The area has lots to offer. We camped at The Villages RV Park at Turning Stone in a Fifth Wheel. Lots of local shopping. FXMax brewing company close by. 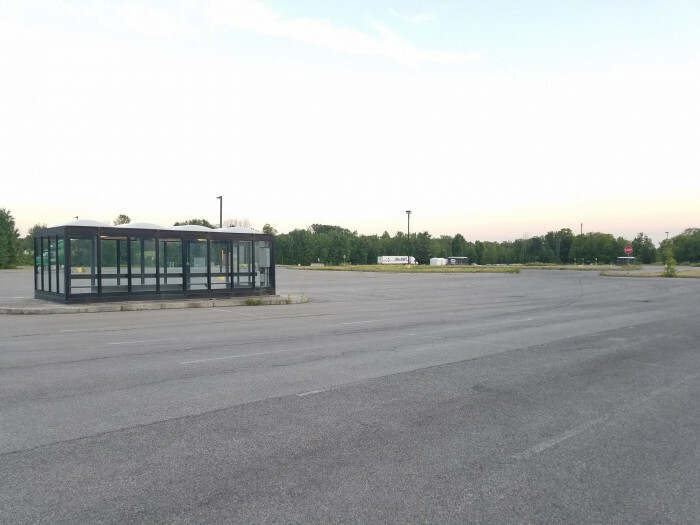 Obviously the Casino is adjacent to the campground - with many restaurants. The buffet is a "must do" when you stay. The casino is nearby with several restaurants. The shutle runs often. You can hop the shuttle to the casino from the camp, we opted not to do so as we are not big gamblers. We instead did some touring. Go to Fort Stanwix which is in Rome. Lots for families to do. We also liked shuttle to casino for restaurants and adult entertainment. Great area for our dogs to run. Even if you do not gamble it is worth the trip to the casino. Several nice restaurants and shops in there. Numerous Wineries and Breweries in the area not to be missed. Casino, Restaurants, Entertainment complex and shopping are all part of this resort. Leave the car "at home" and use the shuttle bus which runs on demand. Casino nearby as well as restaurants, winery, walmart and grocery stores. Ride/walk on the Canal paths. Great trails to excercise on and not compete with traffic. When we arrived I stopped at the RV wash place and made an appointment for 10 AM the following day. No problem leaving and returning to the campsite. If they had had their full staff the day I arrived they would have washed it the same day. I found out about this place by calling the campground on my way in...and they informed me of this place. Also a great place to walk our little dog. Casino nice but crowded and not close to RV park. They have shuttles but they drive though the park at a speed too fast for a campground. The casino has grown since the last time we were there and has table games as well as regular Vegas slots. However, it has to be the smokiest casino we have ever been in, and we've been in a lot. We had to leave because of the smoke. The buffet at the casino is okay. Played golf Pleasant Knolls golf course. It was a nice course. We skipped the casino, partly because we had a dog with us and partly because we heard the smoke level was pretty brutal. So, that saved us some money! Go into Rome and tour Fort Stanwix or go to the casino and lose your money. We ate at the Tin Rooster, a fun place with good food. The shuttle will pick you up at the park and take you to the casino which is a great dining out convenience. Take a drive to Rome, NY to eat really good Italian food. Check out the buffet at the casino. Ask for the senior discount (55+?). The casino is the thing to do... check out the shows...some big acts come here. Also Seasons Harvest buffet restaurant was exceptional...they have Friday fish special for $22 bucks that offers all the traditional non fish fare and adds lots of shrimp, scallops, mussels, oysters, halibut etc. to their normal cooking stations. ALMOST as good as the very best in Vegas for about 1/2 the price. Walmart is 3 miles away if you need anything while there. The Villages are a mile down the road from the casino on the opposite side of the road . Sign up for the rewards card at the casino as you will get free slot play. I got $11 in free play. Large casino with plenty of tables and a large poker room. Great campground with lots of activities and Casino, restaurants and shows a free shuttle away! We were there for two rallys so the price changed from $44 - $43 - $37. Turning Stone casino down the street. Nice ice cream stand 1/4 mile away! Historic sites close by. Convenient shopping in Oneida, a short distance away. Do not try to find park in casino area. Continue past casino 1 mile and campground is on right. The Chinese restaurant at the casino was excellent. The casino has several excellent restaurants offering a variety of cuisines. Our favorite is the Emerald Restaurant that's open 24/7 and offers a good selection of dishes at reasonable prices in a casual atmosphere. Grocery stores, etc., are also nearby. Sign up for your players club card when you check in and get a $10 playing credit, $5 off at any restaurant and discounted golf. I'm sure this is subject to change but it was convenient if you intend to use the casino. The Finger Lakes, Lake Seneca in particular, are beautiful and have great vineyards and wine tasting. Dinosaur BBQ in Syracuse was awesome. Clean your water connection with a Clorox wipe before you hookup, you never know what the last camper done with the water connection before you! Casino is great we love the restaurants especially Wild Flowers and TS Steak House. Are you affiliated with The Villages RV Park at Turning Stone ?